7 7/8"x 7 7/8" (20cm x 20cm) Turkish ceramic 1/4 thick tile set. Main colors on this tile are white, turquoise blue and cobalt blue. 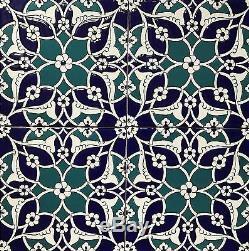 This tile is decorated with Ottoman Iznik floral patterns (third picture shows 4 of these tiles). 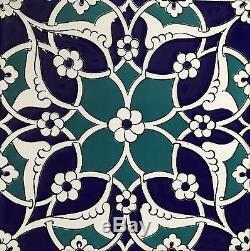 Base color of the tile is white and it is decorated with blue floral designs. Cobalt blue sections are raised (textured) and this gives 3D feel and look. This tile is decorated with original 16th-17th century Iznik floral patterns. These tiles has a layer of glaze on them and they can be used at moist areas. The item "Set of 25 Turkish Blue & White 8x8 Raised Iznik Floral Pattern Ceramic Tile" is in sale since Tuesday, December 13, 2016. This item is in the category "Home & Garden\Home Décor\Tile Art". The seller is "anatoliancarpetsandartifacts" and is located in Dalton, Georgia. This item can be shipped worldwide.